One of the principal goals of those advocating for the adoption of the new state constitution ratified in 1947 was to simplify the complex judicial system which had existed under the Constitution of 1844. Prior to 1947, the Court of Errors and Appeals was the state's highest court, with its name describing its function of hearing appeals and correcting errors in judgment of some 20 lower courts. The Court of Errors and Appeals consisted of the Chancellor (a position which the governor concurrently held under the original 1776 Constitution), the justices of the Supreme Court and six part-time judges. During that period, the Supreme Court was the intermediate appellate court for New Jersey, and its justices also presided over county-level courts, as well as serving on the Court of Errors and Appeals. Jurisdictional conflicts often arose among the lower courts, with confusion as to what types of cases each court was properly authorized to resolve. The 1947 Constitution sought to establish a new Supreme Court as the highest level of the judicial system, eliminate the overlapping jurisdictions of lower courts and simplify the structure of the system. Beneath the Supreme Court, a Superior Court was created where civil lawsuits and criminal actions were initiated, with appeals of those cases submitted to the Superior Court's appellate division and subsequently, at its discretion, to be heard by the state Supreme Court. The primary position of the Supreme Court was further strengthened by Winberry v. Salisbury, 5 N.J. 240 (1950), a controversial decision written by Chief Justice Arthur Vanderbilt, who as a prominent legal scholar and attorney before the adoption of the new constitution had been a leading proponent for the approval of a new state charter and was appointed as the first chief justice of the new Supreme Court by Governor Alfred Driscoll. 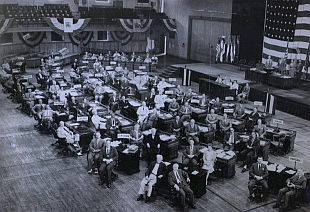 The decision held that under the 1947 Constitution the legislature had no power to enact laws regulating practice and procedure in the courts, with the Supreme Court having the sole authority to regulate judicial practice and procedure, a holding which contrasted with the prevailing law in most other states and with the federal judicial system, where Congress has long been recognized as empowered to legislate on judicial administration. The Supreme Court consists of a chief justice and six associate justices, each of whom is appointed by the governor subject to confirmation by a majority of the state Senate. Justices serve an initial seven-year term, after which they can be reappointed to serve until reaching the mandatory retirement age of 70. By tradition, the partisan balance on the seven-member court is maintained with no more than four justices serving who are registered voters of the same party. Unlike several other states, state court judges in New Jersey are appointed and not elected. The chief justice also is the administrator of the lower courts, and oversees assignments, promotions and discipline of judges. The Supreme Court also supervises conduct of attorneys, including standards for admission to the bar; level of fees charged to clients; requirements for continuing education; and discipline for infractions of rules and state laws. The annual salary of the chief justice is $193,000 and that of associate justices is $151,142. The Court may agree to hear an appeal (grant it "certification") on the basis that it presents legal issues of great importance or because the issue is the subject of conflicting lower court decisions. In very limited circumstances, such as where a judge in the Appellate Division files a dissenting opinion, a party may appeal as of right to the Supreme Court. In deciding the cases that come before it, the Court interprets the New Jersey and the United States Constitution, New Jersey statutes, administrative regulations of the state’s governmental agencies, as well as the body of common law. The decision of the state Supreme Court is final on matters of interpretation of state laws, but appeals may be taken to the U.S. Supreme Court in cases presenting issues relating to the federal constitution. The New Jersey Supreme Court also has been recognized for its controversial activism in intervening in policy areas which critics argue are more properly within the jurisdiction of the legislature. Perhaps the subject which has been the greatest focus of political debate has been the Court's series of decisions in the financing of the public schools, commencing in its landmark ruling in Robinson v. Cahill issued in 1973. In that case, the Court ordered the closing of all schools until the legislature complied with its decision to increase funding for urban school districts to meet the state's responsibility under the 1947 state Constitution to provide a "thorough and efficient" education for all students; the Court's ruling led to the enactment of the state's first income tax in 1976 during the administration of Governor Brendan Byrne, as well as a much stronger state government role in the oversight of the performance of local school districts. A later line of decisions initiated in 1985 in the Abbott v. Burke cases expanded on the Robinson v. Cahill precedent, among other things directing the state to provide billions of dollars for school construction and renovation. More recently, the Court has indicated it will take a less aggressive role in intervening in school financing issues, and in 2016 Governor Christie began attacking the Court's role by proposing a "fairness" program which would sharply cut the additional aid provided to the poorest school districts under the Court's Robinson and Abbott rulings. Another area which has provoked conflict is the Court's intervention in the state's "home rule" tradition where local cities and towns have control over land use and zoning. In cases arising out of Mount Laurel Township, with the first decision issued in 1975 in Southern Burlington County NAACP v. Township of Mount Laurel, 67 NJ 151.. In this and subsequent cases, the Court held that growing municipalities were required to provide for affordable housing, and that practices which excluded housing for lower-income individuals, such as mandating excessively large minimum lot sizes for residential construction, were unconstitutional. An additional point of conflict has been in control over beachfront and tide-flowed waterfront property by municipalities and homeowners, where the Court has issued decisions since the 1970s upholding public access to beaches and rivers under legal principles with roots in Roman and medieval law. Following the damage incurred from Hurricane Sandy in 2012, the Court also has upheld the state government's power to take private beachfront property to construct dunes for shore protection. See Van Ness v. Borough of Deal, 78 N.J. 174 (1978); State Moves Closer to Guaranteed Public Access to Beaches and Shore, NJ Spotlight, August 4, 2016; The continuing sagas of N.J. beach access, March 14, 2016, Philly.com. contract bond proceeds to fund general expenses in the State budget violated the Constitution's requirement that sufficient “revenue” be available to balance the annual budget, but that nonetheless it would allow the funds to be applied to the budget for the year under review, making its holding prohibit the practice only prospectively for the future. In New Jersey Democratic Party v. Samson, 175 N.J. 178 (2002) the Court's reasoning also was questioned for allowing the substitution on the ballot as the Democratic candidate of former U.S. Senator Frank Lautenberg to replace Senator Robert Torricelli, whose election campaign had been faltering, despite the fact that a deadline set by law for the substitution of candidates had passed. The Court justified its ruling on the principle that election laws should be liberally construed to allow a realistic choice of candidates for the electorate. See New Jersey Democratic Party v. Samson: What Remains of New Jersey's Election Deadlines?, Stetson Law Review (2003). The Superior Court is divided into three divisions: the Appellate, Law and Chancery Divisions. Appellate Division judges hear appeals from decisions of the trial courts of the Law Division and the Chancery Division, the Tax Court and state administrative agencies. It is currently authorized to be comprised of 32 judges who sit in two and three judge panels chosen from parts consisting of four judges administered by a Presiding Judge. The Appellate Division decides approximately 6,500 appeals and 10,000 motions each year, and its decisions may be appealed to the state Supreme Court. In unusual situations of urgency and importance, the Supreme Court may order that cases come to it directly for hearing prior to being decided by the Appellate Division. New Jersey is one of the few states which, to some extent, continues to follow the British common law model of separate courts of chancery and law. The Superior Court's Chancery Division, which historically in Britain was limited to providing non-monetary relief such as issuing injunctions to enforce compliance with contracts or other agreements, continues to offer such relief, but is also authorized to award money damages where appropriate in actions filed primarily for equitable relief. The family part of the Chancery Division hears divorces and other cases arising out of marriage (or marriage-like) relationships, juvenile matters, adoptions and domestic violence cases.Similarly, the civil part of the Law Division, which primarily handles suits for money damages, may also order limited equitable relief. The criminal part of the Law Division handles all indictable criminal cases and appeals from convictions in municipal courts. The Tax Court, comprised of 12 judges, hears appeals of decisions made by the Director of the Division of Taxation on such matters as state income, sales and business taxes, and homestead rebates, as well as appeals of property tax decisions made by County Boards of Taxation. Appeals from Tax Court decisions are submitted for hearings in the Appellate Division of Superior Court. Tax Court judges are appointed by the governor for initial terms of seven years, and upon reappointment are granted tenure until they reach the mandatory retirement age of 70. The Tax Court handles approximately 15,000 cases per year. The 515 municipal courts handle approximately six million cases each year. They are considered courts of limited jurisdiction, having responsibility for motor vehicle and parking tickets, minor criminal-type offenses such as simple assault and bad checks, municipal ordinance offenses such as health or building code and fish and game violations. A municipal court usually has jurisdiction only over cases that occur within the boundaries of its municipality Many serious criminal cases, such as robbery, auto theft, or assault, start out as complaints filed in the municipal court but those cases are transferred to the Superior Court located at the county courthouse. Unlike state court judges, most municipal court judges are appointed by the mayor of the relevant municipality, with the advice and consent of the council, or in some cases directly by the council or other governing body. In joint municipal courts, which are courts serving more than one municipality, the appointment is made by the governor with the advice and consent of the state Senate. Municipal court judges serve three-year terms, do not have tenure and are not subject to a mandatory retirement age, characteristics which distinguish them from other judges in the state judiciary. The majority of municipal court judges serve only part-time and, as a result, are able to maintain private law practices or other employment which does not conflict with their judicial role. In the fiscal year that ended June 30, 2015, the municipal courts heard nearly 49,000 criminal cases and over 419,00 civil cases. In a report authorized by the state Supreme Court released in 2018, the current municipal court system was sharply criticized, with its findings including that municipal court practices “… at times have more to do with generating revenue than the fair administration of justice.” It noted municipal courts generated $400 million in annual revenue in fines and other fees, with more than half of the amount going to the municipalities in which the courts were sitting, and that prior media investigations and bar association studies had suggested that there was a public perception that municipalities are increasingly relying on fines from tickets as a source of significant revenue .Recommendations for reform included basing fines on fairness and ability to pay, appointing and evaluating judges by objective standards; setting guidelines to prevent overuse of contempt sanctions and license suspensions; limiting the issuance of bench warrants to serious offenses; and merging some of the courts. The county prosecutor is a constitutional officer, nominated and appointed by the governor subject to confirmation by majority vote of the state Senate. County prosecutors serve terms of five years in their jurisdictions as the representative of the executive branch of government in the enforcement of the criminal law. Each prosecutor is given, by statute, within his or her county, the same powers as the Attorney General of the state and is authorized to present cases to county grand juries for potential indictment. A grand jury decides whether there is enough evidence for a person to be brought to trial for a crime pursuant to an indictment, an official, written accusation charging someone with a crime. Grand juries consist of 23 people who typically meet once a week for 16 weeks. Grand juries are supervised by prosecutors, who decide what evidence to present to the grand jury. Unlike criminal or civil trials, grand jury proceedings are not open to the public and those witnesses subpoenaed to testify do not have the right during their appearance to be represented by attorneys. Prosecutors oversee a staff that includes assistant prosecutors, detectives, and clerical and support personnel. The investigative division is also supplemented by officers employed by the County Sheriff and police of the county's municipalities. In its most recent statewide survey of New Jersey residents conducted in May 2015, Fairleigh Dickinson University’s PublicMind Poll found that race is a determining factor in attitudes toward the police and other institutions, including prosecutors and the availability of competent legal assistance. Three quarters of whites (75%) trust police to treat everyone equally, with only 42% of black respondents agreeing. Nearly half of whites (47%) responded that they had “a lot” of trust in the police compared to only 14% of blacks.